"Memories of Boston - Revolution City"
Limited edition of 1776 prints 20"(524mm) x 29"(743mm), 2003. After his successful cityscape prints of towns and cities mainly in England, Stuart turned to New England for the first of his American art prints; Boston. The waterfront with its reminder of Boston's historic past, early districts such as North End and Beacon Hill are reflected in his Boston painting. The importance of The Common and The Public Gardens on the life of the city together with many of the special buildings along the Freedom Trail are not forgotten in his Boston composition. The ubiquitous brick sidewalks appear, as do some of the gleaming buildings of the tightly drawn financial center. Copley can be glimpsed with Trinity Church and the stunning John Hancock Tower, and room had to be found for Fenway Park (including the 'Green Monster'). A glimpse of the Big Dig can be seen in this Boston cityscape along with some of the special Bostonian features such as; the ducklings, the swan boats, Hoods ice cream stand, and of course the Boston Tea Party. 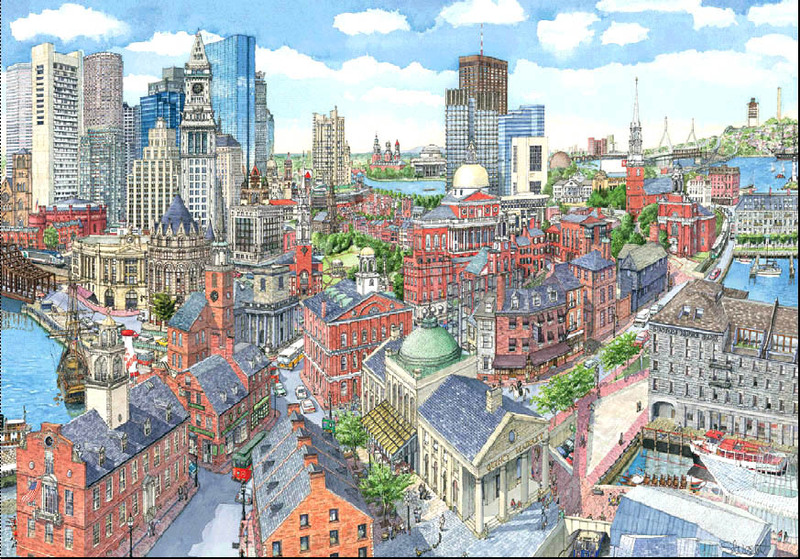 Not everything is here, but the artist has tried to create the feeling of this historic city in one Boston artwork, a feat which usually would take several Boston paintings to achieve!